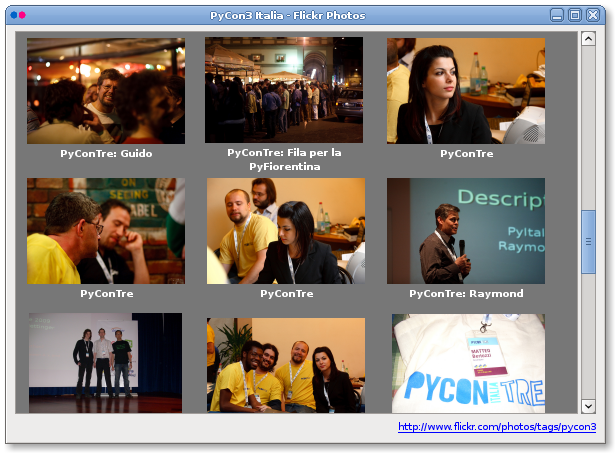 PyCon3 was finished, Only one week is passed and I already miss it. Guido van Rossum, Alex Martelli, Ariya Hidayat, Raymond Hettinger, David Boddie, Fredrik Lundh... C/C++ and Python Developer not .NET "coders" (I hate even more my boring .NET job). Following the PyCon week, here a simple example of PyQt4 that allows you to see up to 500 photos tagged PyCon3 on Flickr. As always the source code is available here: PyQt4 PyCon3 Flickr Source Code.